Over the past 20+ years IDT has partnered with hundreds of churches from all over the USA and Canada to build 1000’s of homes for local needy families. About 3 years ago the majority of the construction ministry was separated from the IDT covering and placed under Heart Ministries, lead by Bill Sopher, a missionary with IDT for over 15 years. IDT still participates actively in this ministry, specifically in the interviewing, selection and follow-up ministry of families benefited by this ministry and most of our missionaries participate in the construction and group hosting responsibilities. The house build ministry is not only a life changing experience for the families who receive these blessing but also to those involved in making it happen. We have seen 100’s of people come to Christ through this ministry, not only of the families who receive the homes, but often people coming with the groups have experiences that lead them to receive Jesus into their hearts for the first time or rededicate their lives to the Lord. It is such an amazing thing to witness and to be a part of! The past month we have been busy with the house build family selection process. We interview hundreds of people coming to us for help in regards to housing. The requirements for the selection process are that the family own or be current in the payments of their land, have documentation to prove it, and that the land is in the name of the wife, or of both parents. We want to make sure dad won’t leave and sell the house out from under his family. Buying your own little property is pretty accessible, even to field workers, in places where there is no access to water or electricity yet, especially if 2 or more people in the family are working, and can cost as little as $60,000 pesos (about $3,500 dollars) for a 30 x 50 ft lot. A down payment on a piece of property is usually 1000 pesos, about 60 dollars, and the payments are 1000 pesos a month until they pay it off. Another requirement we have, is that the family already be living on the lot. We want to make sure they don’t already have somewhere else to live because many people will ask for a house on their property and not go to live in it because there is no electricity, and instead, stay with relatives or rent a room elsewhere. Sometimes we make exceptions to this rule for families with special needs or those who are well known to us, if we can be assured that the home will be used for them to live in, and not sit empty, sold or be rented out. There are a lot of people who try to take advantage of this blessing, so we interview and visit all those who are eligible a few times before making the decision. This process gives us a lot of close contact with families we might never otherwise meet and gives us a chance to share the love of Christ with them. We always tell the families that it is the Lord who provides their needs, and not us, that he is a faithful provider and he sees their need and will answer them if they cry out to him. Another amazing aspect of this ministry is the way the Lord leads us in the choosing, there are so many needy families and we can’t help them all but we often feel the nudging of the Holy Spirit in who He wants us to choose and what groups we should assign them to. We have witnessed many awesome “God appointments” between the families and the groups that build for them that we could never have arraigned! We work with many local congregations and we try to connect the families with a nearby congregation for their future spiritual growth and fellowship. We ask for your prayers in this ministry; that the Lord would be in our midst during the selection process, that He would soften hearts, and His Word would go in and bring light to many through this work, both to those benefited, and those who contribute, and for protection and provision for those who have been moved to participate in this ministry. The sewing class at the IDT tech school has been in session for a month. In February, we received a timely visit from our faithful friends from Wintersburg Church in southern California, bringing all the needed supplies for the class, which is now in full swing, using the sewing machines also donated by a member of this church. The beauty and carpentry classes will be starting soon. All of our classes have earned much recognition and have long waiting lists. We wish we could take more students but resources and teachers are limited. All our teachers are volunteers and all our supplies are donated. The Lord generously supplies for these classes through individuals and churches as He leads. Sometimes people would like to donate things, like tools and sewing machines, but we have no way of getting the donations here. Another need we are praying for is a teacher for the mechanics class. We know the Lord has a plan for this ministry because He has supplied the beginning of the mechanics facility, enough tools to begin, and the interest in the local community. We’re just waiting for the teacher! We are also praying for the Lord’s guidance in how to attack the great need of the local at risk youth living around the dome. Many young boys are turning to sniffing glue in the streets to fill the hole in their impoverished lives and we are so saddened by the damage that Satan is wreaking in and through them. We know this is on the Lord’s heart, we pray for wisdom and grace to minister to them. We were blessed this past week with a visit from friends from Camarillo CA, who brought down and installed more solar panels at the girl’s home. This is an awesome blessing; their goal is to get the system to the point where there is electricity 24/7 in the home. This is their 3rd or forth trip and on each one they bring and install more equipment for the system. This equipment is very expensive and we could never do this without them. This is made possible mostly by their own contributions, and gifts from a couple local churches in Camarillo California. What a blessing! Please make the corresponding change in your records. We will still have our PO Box in Coronado for a couple more months and we get anything that gets sent there and will continue to receive personal mail and packages there until May. The success of our IDT technical school rises to the top. Over the past year we have seen more growth and community involvement than ever before. A lot has happened with our Estetica School since our last post, and unfortunately we have not been able to give updates as often as we’d like, but let us try to catch you up on the recent highlights and exciting accomplishments this program has enjoyed over the past few months. We are coming to the end of our second generation beauty school class. In only two terms, this school has already made a name for itself in not only its immediate community, but also in the surrounding villages. Currently these classes have a capacity of about 16 participants, and the waiting list guarantees that every seat is filled. Still, the benefits of this program reach well beyond the students enrolled. Each week on class day, locals line up at the door in order to wait their turn for whatever service they have come for. Not only do the students utilize their newly learned skills in the classroom, they also put them to use doing outreaches in schools as a service to give back to the community. Last month the focus was on hair coloring, teaching techniques and styles for dying hair. It is always fun to drop in on the class because you can see at a glance what it is they are currently working on. They take turns practicing on each other in each discipline they learn, so when it comes time for learning about hair dye, you will find all ofthe students done up with new hair colors and highlights. Recently they had a guest teacher come in from a local barber shop to give a special lesson on the most hip and popular male do’s, including cool hair design work with electric clippers. Things like this are exciting because we know that the graduates of this program are truly going to be well rounded in their skills and equipped to provide desired services that are in current demand, therefor being able to effectively make it a realistic source of support for their families. Beyond everything that has been mastered over the past semester, it is the culture established among the group that is most impressive. A close knit community has been woven within the participants. The entire class work together as a family, going beyond the scope of the program to put on holiday events and get-togethers. They have taken ownership and pride in their education here, pulling their own funds together to design and order custom uniform smocks for each of them. It is refreshing to watch how they have grown, and the commitment they give to their self-development. We are currently planning the graduation event which will be held in August. This is a time to celebrate all that the class has accomplished, and to recognize them for their hard work and dedication. As each of our Technical School students Graduate, we like to send them off with a gift that will be useful to them when taking their new skills out into the professional space. At this time, we still do not have anything to give to our Estetica School students. So if you are someone who is interested in partnering in this program, this is definitely an area we could use your help. Ideally our hope is to give each graduate electric clippers, which would be an amazing gift, and equip them with something vital for success in their new career. Other great gifts would be hair scissors, and heat tools such as blow dryers and straighteners (even quality used tools would be awesome). Also, small donations of hair brushes, hair clips, hair ties, and other salon essentials would be a treasured addition to their graduation gift/kit as well. This class has truly been successful at “teaching the man how to fish,” in order to feed him for a lifetime, rather than “giving him a fish” to feed him for a day, but beyond the blessing this program gives to the students, these classes also provide a time of fellowship. Our students are made up of all walks of life, and it gives us an opportunity to not only bridge the gap between separations of different social and ethnic groups, but also to share and show Gods love and goodness to individuals who might otherwise keep a distance between themselves and the gospel. We feel so fortunate to be able to facilitate such a program, and blessed to watch it grow. Thank you, to those, who have previously partnered in making this program a possibility! If you are someone who has connections to local salons around you, or know someone who does, and would like to partner in the everyday needs of the program there are various ways to do so. These courses are run on donations and gifts, so everything, no matter how small, can make a difference, now and in the future. We could even use half full products, used tools, yesterday’s solon equipment. Please don’t feel that if you can’t make a large donation it won’t help, even small gifts are greatly appreciated! 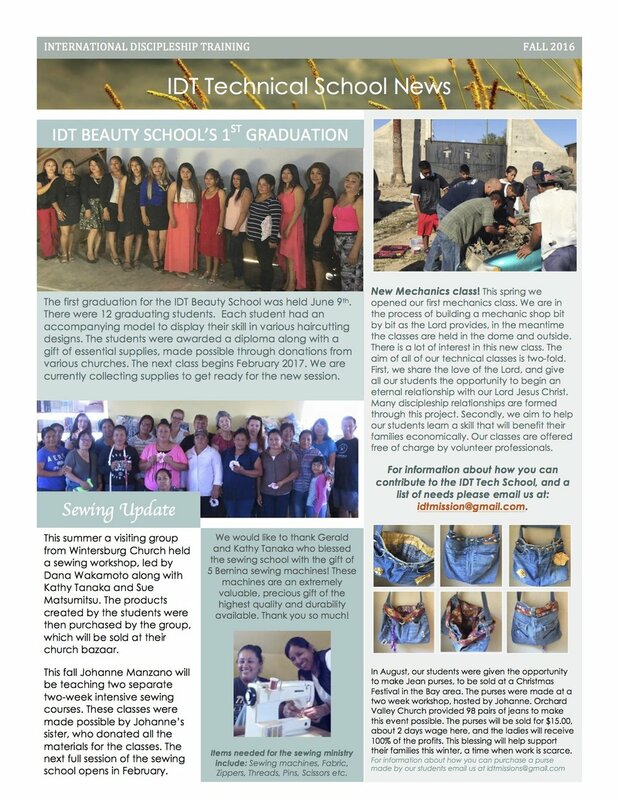 For more information on our Estetica program you can visit the Beauty School Page on the IDT website. You can also reach out to our missionary partner, Hope Manzano, and she can direct you to where you can go to make one time or ongoing donations towards this class. Since our graduation is coming up in just a few weeks, we are hoping to identify sponsors soon in order to make their graduation gifts a reality. Click here for a PDF version of our January Newsletter. We Lost our old website, domain, blog, most of the content and all our previous hard work done by some really great friends and IDT family to get that going. So we're starting new! New site, new web domain with new ministry email addresses and new Blog! It's going to be under Construction for a couple weeks so bear with us please! BUT we are working hard to get it all up and running. In the meantime please feel free to contact us for any information you can't find on our site at idtmissions@gmail.com. There are a lot of new and exciting changes and developments going on here at IDT right now so stay tuned for our newsletter to find out all about it! You can subscribe to our email list by clicking here. But don't wait for our newsletter, you can like our Facebook page now to keep up with our day to day triumphs and challenges. So check out our new website and hey, we'd really appreciate any feedback if you find any glitches or embarrassing typos! Friends don't let friends misspell!